Each frame is .1 second apart. In this race, Pieter van den Hoogenbond equaled the world record he had established in the semi-final with a time of 1:45.35. In claiming the gold medal, he beat Ian Thorpe of Australia. In this first lap of the race, when fatigue is not high, Pieter van den Hoogenbond's stroke frequency was 51.1 strokes per minute, a stroke being from a hand entry until its next entry, and the time for the first 50m was 24.44 seconds. Frame #1 through #3: Several things are noticeable about this sequence. The right arm is completing its propulsive phase, which is still direct. In frame #2, the hand is still deep although it has passed the hips. This is indicative of a very long effective propulsive phase. The left arm entry is far in front of the swimmer, almost at full arm stretch. However, as soon as the arm enters (frame #3) it begins to reposition (the elbow bends and the upper arm medially rotates). The streamlining of the swimmer is very good. The line in frame #2 is perfect. In these three frames, the head is returning from breathing on the right side. Frame #4: The left arm continues to reposition well in front of the swimmer. The classic initial movements (elbow flexion, medial rotation of the upper arm, fully extended shoulder) of an "elbow-up" stroke position continue. The counterbalancing right leg kick is particularly shallow, finishing only slightly below horizontal. The left leg prepares to kick. Frame #5: The left arm forearm/hand-propelling surface continues to be repositioned. The upper arm is almost at full medial rotation. The powerful action of adduction of the upper arm is just beginning. The head is quite low with the eyes being oriented to the pool bottom. Streamline remains excellent. The left leg has the knee bent ready to kick. This will produce a kick where the knee rises and the foot goes back and down, resulting in a minor backward force for a short period. Frame #6: The right arm is close to a perfect position. That the hand/forearm is the propelling surface can be seen in this picture. The milky drag-force turbulence is visible from the elbow to the fingertips. Adduction powers this large propelling surface in an almost horizontal direction. Streamline is excellent. The depth of the left leg kick contributes to the streamline. When considering the kick, one is set to wonder if many swimmers, even of the highest performance caliber, are trained to use kicks that are too large! The head is well down with the face profile almost parallel to the pool surface/bottom. Frame #7: Left upper arm adduction continues to move the hand/forearm-propelling surface directly backward. The power of this action can be seen by the large size of the drag force turbulence, possibly the largest seen on any analysis on this web site. Another feature of the propulsive force is its horizontality, something that adds to its efficiency. The left leg completes kicking and hardly deviates below the streamline. The head remains low and oriented toward the pool bottom. The right arm has entered at full stretch. Frame #8: The left arm completes adduction and prepares to extend. The right leg kick is complete and remains in streamline with the rest of the swimmer. The left leg rises preparatory to kicking. The streamline of this swimmer is exemplary. Frame #9: Left arm extension continues to push the hand back and deep. Up to this stage, there has been almost a continual direct propulsive force along the horizontal plane. The absence of vertical aspects is remarkable. The left leg begins to kick. Frame #10: The left arm exits. Less than .1 second elapses from the end of direct propulsion to exit. This movement contrasts markedly to the sweeping round-out action that typifies a good part of many arm extensions in crawl stroke. Streamline is still prevalent with the waterline on the head well up on the cap. The right arm begins its pull. The whole arm begins to be depressed while the elbow bends. This contrasts with the left arm pull where the elbow is held high and forward until the very last possible moment. The left leg kicks. Frame #11: The right arm pull is still a whole-arm sweep down. Continued bending at the elbow keeps the elbow wide of the centerline of the body, with the hand/forearm being oriented under the swimmer. Up to this stage, the pull has mainly been a downward press. The inward rotators modify adduction to produce this movement. Streamline is still very good. The left leg kick has elevated the left hip to bring the shoulder- and hip-rotation angles into line. Frame #12: Right arm propulsion is now mainly backward. Since the shoulders/hips have rolled, the upper right arm is primarily adducting to generate force. The head begins to rise preparatory to kicking. The leading edge of the streamline starts to break. The right leg kicks. Frame #13: Right arm propulsion continues but with weaker force than the left arm because of the overuse of the internal rotators at the shoulder. The swimmer is well positioned over the propulsive surface of the arm. The right leg kick is completed. The head has left the water and is turning to breathe. Frame #14: Deep right arm extension continues generating very direct propulsive forces. This is a feature that could distinguish why Pieter van den Hoogenbond is so good. A position almost similar to that in frame #1 is attained. Inhalation is about to begin. Frame #15 and #16: Inhalation to the right is achieved. Right arm propulsion is completed. Repositioning of the left arm begins. 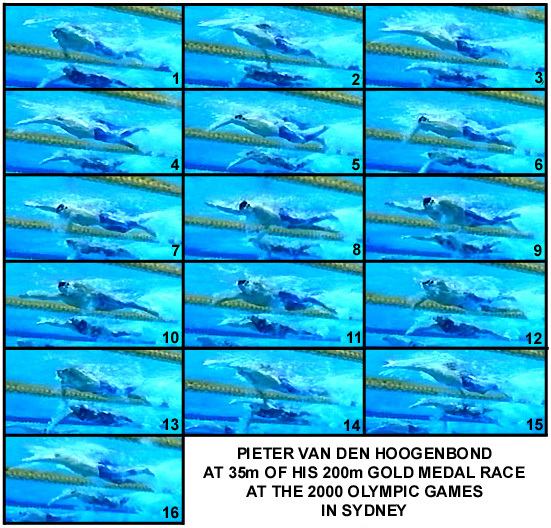 Several features of Pieter van den Hoogenbond's swimming are worth noting. The directness of pulls with the full hand/forearm surface is amongst the best displayed on this web site. Not only are they more direct, and therefore, exhibit close to the least vertical movement component during propulsion, the length of the effective pull is also close to the most extensive witnessed. The left arm pull approaches perfection. Despite the right arm starting less efficiently, the latter part, the extension phase, of both pulls remains deep and direct. Neither arm extends fully at the end of the pull, however the round-out that is displayed is minimal but still beneficial and technically correct. The shallowness of the kicks is another outstanding feature. Anytime a crawl stroke kick drops below horizontal, it creates drag resistance. Pieter van den Hoogenbond spends little time with either leg below streamline. This leads to an hypothesis that bigger kicks exhibited by most other swimmers are excessive. That excess is usually required to counterbalance excessive vertical movements in the early phases of the arm actions. By limiting vertical movements after entry, this swimmer does not require large kicks.